-Holds most standard wine bottles. -A great gift for any special occasion. -Made of metal to last you for a long time. -The bottles slant down to ensure the corks do not dry out. -This stylish piece holds up to 54 bottles, it is the best space-saver ever. -Holds wine bottles in proper horizontal alignment, helping prevent corks from drying out and potentially ruining valuable wines. -Offering a sleek and chic look to any home, kitchen, dining room, can be easily positioned anywhere you have about two square feet of free floor space. Please put all the metal pieces and screws in correct position, keep screws slightly loose until all are in place to avoid the shelves from torque-ing, then tighten them down. SPACIOUS CAPACITY - Holds up to 54 bottles, each 750 ml in size. Holds plenty of the nice wine for small gatherings, dinner parties, holidays, special occasions, cocktail hour...folds flat easily when not in use. Will be a very nice addition to your wine cellar! HEAVY DUTY - Made with durable iron construction - 9 floor levelers are located on the base to provide a stable and balanced stand. Metal material has been coated with a black powder-coat finish to protect from scratches and easy cleaning. EASY TO ASSEMBLE - Minimal assembly required - Super EASY to assemble (10 minutes or less). There is no heavy, time consuming assembly required with these wine racks, step-by-step assembly instructions and hardware included. CLASSIC DESIGN - Classic design to accent any home, kitchen, dining room, or wine cellar - Also makes a great gift for any special occasion. A slight tilt design helping prevent corks from drying out and potentially ruining valuable wines. DIMENSION(in inches) - 36 H x 24.8 W x 9.8 D - 9-tier. 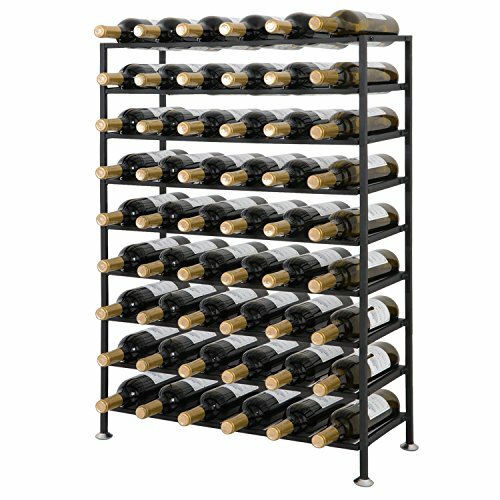 The bottom of this wine rack has 4 feet, each fitted with a plastic insert that protects your flooring or countertop from scratches.1 year warranty. View More In Freestanding Wine Racks & Cabinets. If you have any questions about this product by Smartxchoices, contact us by completing and submitting the form below. If you are looking for a specif part number, please include it with your message.